Chinese ecommerce platform Alibaba’s $25 billion initial public offering on the New York Stock Exchange roared to life in mid-September. The IPO was a financial industry high-water mark—the biggest ever—and a challenge to the shopworn notion that all Chinese companies are weak innovators. No one is equating Alibaba with Google or Amazon, but what the Hangzhou-based company founded by Jack Ma can do is take elements of innovation by global companies and make them work in China—far better, it seems, than any foreign multinational is capable of doing. Meanwhile, banks are vying in an intensely competitive market. Traditional banks are answering the challenge by Internet upstarts like Alibaba by innovating in ways that break the mold. 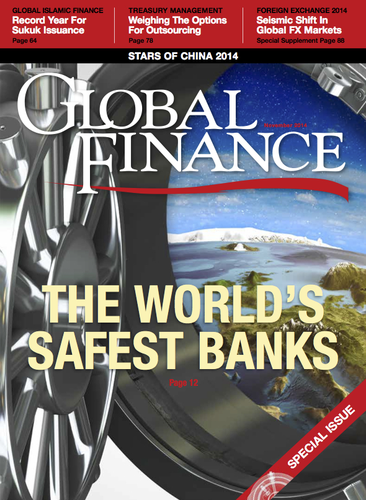 In the following pages, Global Finance names the leaders in this energetic phase of China’s development—and the banks that support their vision.